The Rock City Angels are auctioning off a copy of their Young Man’s Blues LP for charity. 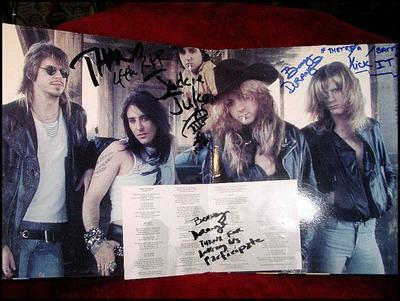 The LP, signed by Bobby Durango and Jackie D Jukes, was donated to Johnny’s Angels to raise money for the Children’s Hospice and Palliative Care Coalition. The auction can be viewed at this ebay.com link. The Rock City Angels released Young Man’s Blues in 1988 on Geffen Records, and this auction consists of the original double LP, not the reissue. Johnny Depp was once a member of the band and co-wrote a song on LP as well.